Since I’m not doing anything else at the moment, I bought a set of fabric paints to play around with. 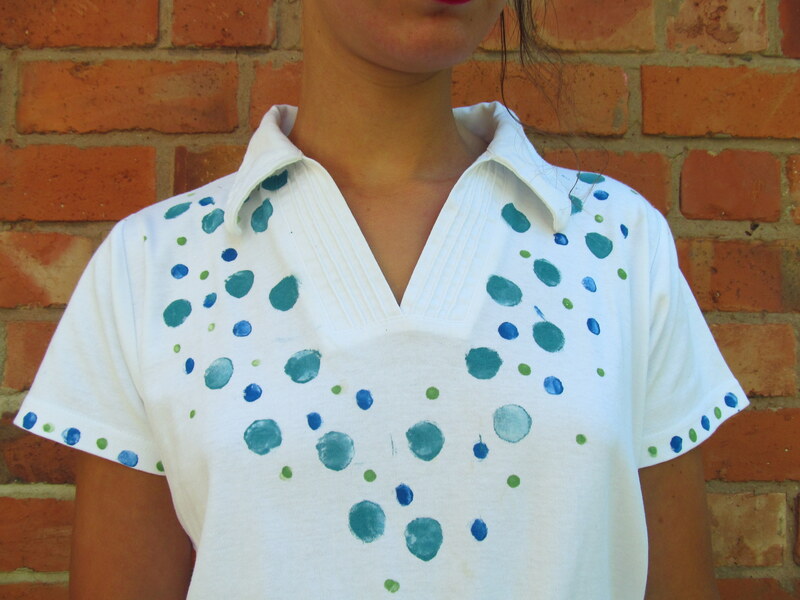 My mum asked me to liven up one of her white t-shirts, and I decided to attack it with potato prints! This was actually a really fun and quick DIY, and I will definitely try it again! Next time I might use vegetables like apples and oranges that don’t need carving because they have such cute shapes already. You might notice that I’m wearing disco pants in these photos. I read in a magazine the other day that you shouldn’t wear disco pant because they are “out” and for some reason it made me really cross – I love my disco pants! So, I’ve decided to wear them all the time (even in the daytime!) in retaliation. Take that bossy fashion lady. Maybe I’ll even treat you to a disco-pants focused outfit post. Step 1: Put something under the first layer of your shirt (like newspaper) to prevent paint from leaking onto the back. 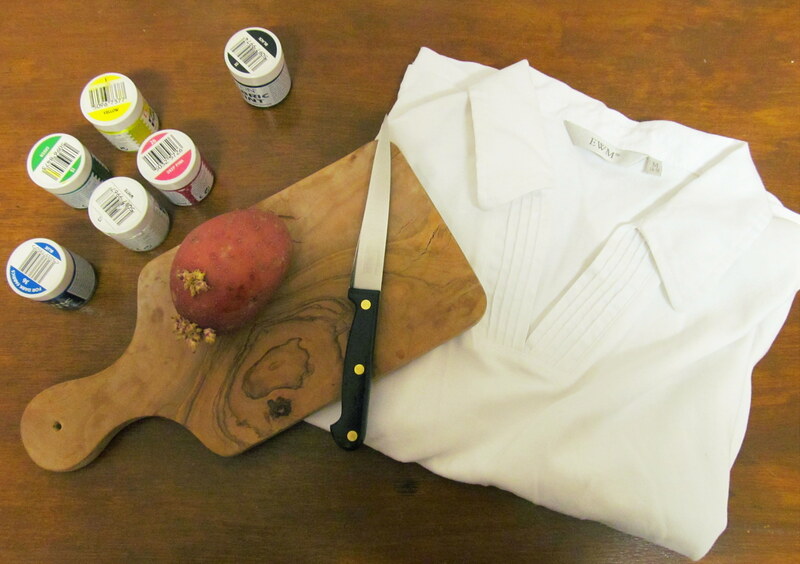 Step 3: Pour some paint on your palette, dip your potato in, and print onto your fabric! Make sure you wipe the excess paint off the potato first, so that you get a clear print. I had some blobs of paint where I didn’t want them to be, so I covered these up with smaller circles. 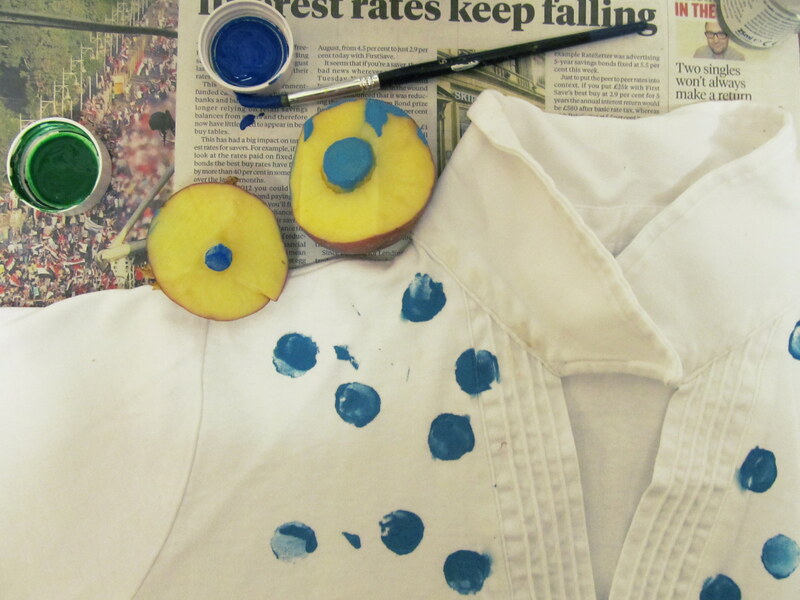 Step 4: Wait for your paint to dry, and then cover your shirt with greaseproof paper and iron for 2 minutes. This will fix your paint so that you can wash it! I really like how this turned out, I think simple patterns work the best! What do you think? I am STILL in the process of sorting out my uni things since moving back home. I have literally twice as much stuff as space, and deciding which things to store or get rid of is tiring! What are you up to this week? Wow this is such a cute idea! The shirt looks lovely! I had never thought that it’s DIY! Cute!! I love the DIY And loving the pants! Who cares if they’re ‘out’? what a fantastic idea! your blog is terribly lovely. I really like how it turned out, it looks pretty and cute! That is a very creative way to add a flare to a plain shirt. Good job! Such a good idea! And don’t worry, my disco pants are out and proud, I love them! Fun idea! I’d give it a try. The top looks really good! It’s hard not living with you Jess, noone can edit my clothes for me. And because I miss you anyway! that’s such a creative idea! and the blouse came out beautiful! !